From the dawn of multi-messenger astronomy to the discovery of more Earth-sized exoplanets and a solar eclipse that captivated millions, 2017 was a year in which humanity turned its gaze skyward. Many believe we have entered a new “golden age” of physics. Researchers at Perimeter continue to probe for answers about dark matter, quantum gravity, black holes, and the birth of the universe. 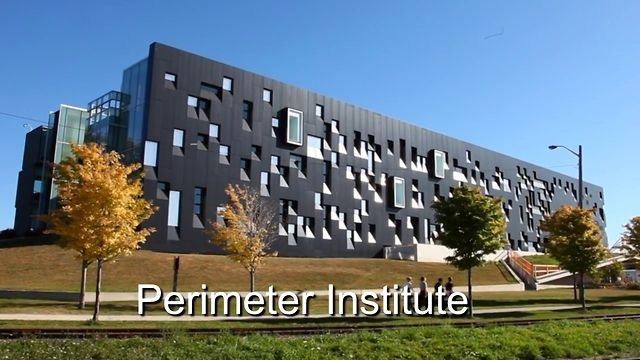 In November 2017, Perimeter announced the creation of the Centre for the Universe – a new hub for cutting-edge cosmology research. Centre patrons include world-renowned cosmologist Stephen Hawking and Nobel Prize winner Art MacDonald. The Centre will bring together international scientists, bridging fundamental theory and experiment, to tackle questions about the origin, evolution, and fate of the universe. The Event Horizon Telescope (EHT) project turned its incredibly precise gaze toward a black hole earlier this year, and the scientific world awaits the resulting imagery. A process called Very Long Baseline Interferometry (VLBI) is used by this network of eight large radio telescopes to capture history’s first picture of a black hole’s event horizon. Avery Broderick leads Perimeter’s Event Horizon Initiative, which will help analyze and interpret the data collected by the telescope array. The EHT team is waiting for the last remaining data to arrive from the South Pole and expects to have results early in the new year. Innovation150 – a part of Canada 150 celebrations – was led by Perimeter, with the Power of Ideas Tour visiting cities and towns across the country. More than 100,000 people attended tour events and many more attended talks, festivals, and other Innovation150 experiences. Perimeter’s Emmy Noether Initiatives continued to celebrate and support women scientists throughout the year. A free, downloadable poster series also shone the spotlight on some women pioneers in physics. Advances in creating quantum light, determining what dark matter isn’t, sharing the wonders of science – Perimeter was a bustling hub of research, education, and outreach in 2017. Read more at http://www.insidetheperimeter.ca. Thank you for joining us on this journey. We look forward to sharing more exciting news with you throughout 2018. ← From SURF: “Lab Director looks back at 2017” A Gigantic and Important Laboratory in The U.S.